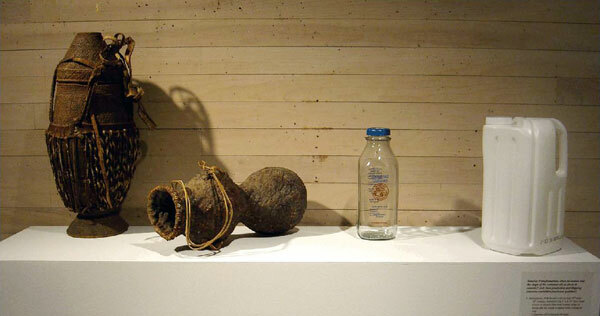 An exhibition of handmade, designed, and mass-produced objects. Sawhill Gallery School of Art and Art History College of Visual and Performing Arts, James Madison University, 9 November–4 December 2009. People of all cultures have made objects to use in both their daily and their ritualistic lives—things such as chairs, tables, blankets, pots, urns. From time immemorial, such objects have been made by individual human beings, even if organized into groups as workshops. 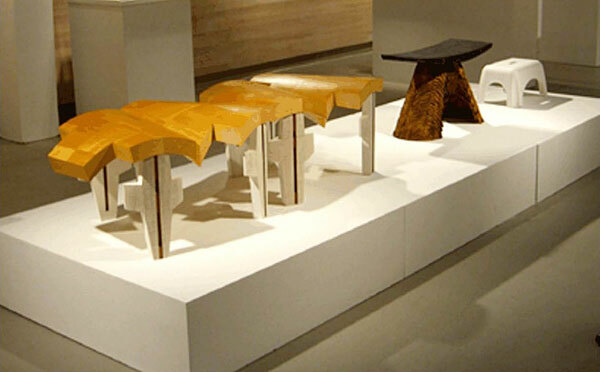 These individuals always worked with their hands in order to shape raw material into functional form. 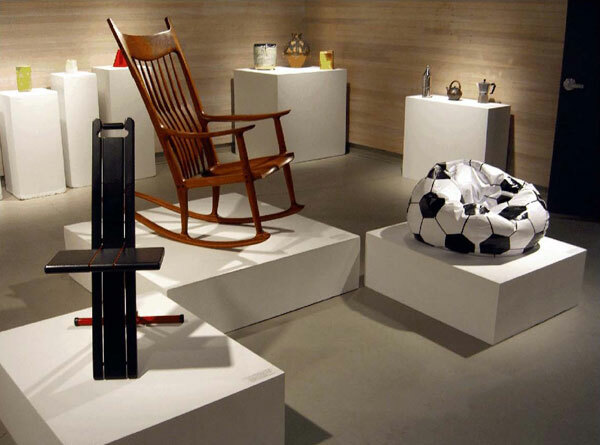 In doing so they created objects that expressed something of their society’s values and deeply held beliefs. This is because these values and beliefs, so deeply ingrained in the individual’s cultural psyche, conditioned how hand and mind worked together. This is true of the ordinary objects they made as well as those special objects intended for social, political, and religious purposes. Furthermore (or perhaps one should say because of this), such objects also have an essential human quality about them. Being made by the hand means that they not only come from someplace, they come from someone, from another human being. Simmel goes on to write that “Through this anonymity the interests of each party acquire an unmerciful matter-of-factness; and the intellectually calculating economic egoisms of both parties need not fear any deflection because of the imponderables of personal relationships.” When using handmade objects, even if only in our imaginations, we automatically re-enact social rituals that span millennia. But more than this, as Simmel realized, when using handmade objects we are also having an encounter with another human being; we are connecting to another person and, therefore, to a life outside the solitary self. In this sense, the idea that handmade objects come from “someplace” has little to do with geography as such and much to do with human social values—values that transform the lone individual into a social being with connections and responsibilities to others, not just to the self. This connection cannot help but impart a temporal, human dimension to the work, which thereby gives added meaning to the rituals, whether quotidian or not, that such objects embody. In the age of the handmade, these parameters—boundaries, if you like—were accepted by everyone, almost without conscious thought. But what happens when there is no maker’s hand connected to the work, only a designer’s plan for its machine production? Moreover, what are the ramifications of industrial systems of production when a design object is not only realized in vast quantities that are far beyond human capabilities, but production continues indefinitely beyond the designer’s lifetime? Have we now entered a realm of “place-less-ness” in Simmel’s sense, one in which objects are cut free from the temporal and physical limitations of the human hand and float in a timeless world without apparent human limits and boundaries? Because of the influence of design and mechanical-industrial production, the look of things is now more and more likely to take precedence over their usefulness, their functionality. That’s one reason why we now endure pitchers that don’t pour gracefully and furniture that is unstable or doesn’t fit the body. In addition, since unlimited production has made possible the inexpensive, throwaway object, convenience has become an overriding social value thereby giving rise to an economics of disposability. As a consequence, we now have containers marred by advertisements and landscapes dotted with overflowing landfills. What does it mean to live in such a world, one in which limits and boundaries have been reconfigured, even distorted? This is a world in which former notions of social grace, civility, and even frugality that were embodied in the handmade object have been reconfigured around consumption and waste in the name of an economy of individual comfort. Is our fondness for things quick and convenient—an attitude now deeply ingrained in contemporary behavior—degrading both the quality of the objects we use and the rituals that sustain social life? In other words, in a grab-and-go society like ours, dominated as it is by a culture based on convenience, are the objects we use helping to structure our lives in meaningful ways or are they propelling us toward the amorphous? 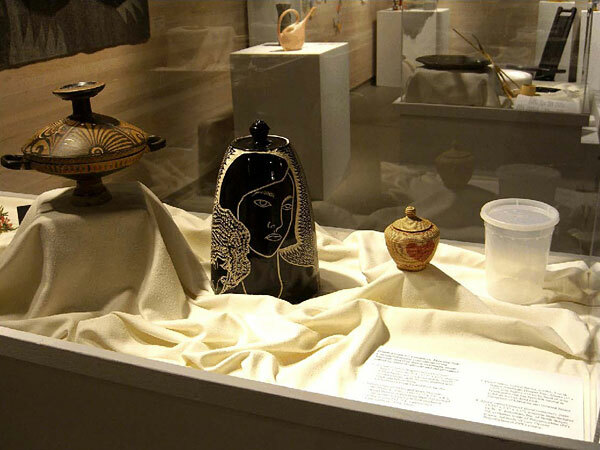 It seems to us that, in response to such a situation, it is not just a question of returning thoughts and feelings to objects (heirlooms and souvenirs already do this) but of creating objects with aesthetic qualities, qualities that will engender thoughts and feelings of a deeper, more profound nature. We would like to extend special thanks to Gary Freeburg and his staff for their careful and thoughtful installation and to all of the lenders. Likewise to James Madison University media services for their help in the video production and to the JMU students whose actions were featured in the videos. What is the relationship between bodily comfort, social etiquette, and high style? Have personal comfort and the demands of high style transformed what was once considered proper social etiquette? 1. Sam Maloof (1916-2009), Rocking Chair, 1990, (approx 48" x 22" x 36"); handmade of wood to carefully fit and support the human body in all its types, from large to small, tall to short, and skinny to plump. Collection of Randall and Carol Edmonson. 2. Designer unknown, Folding chair, c.1987, (33" x 14" x 17.5"); hand assembled of machine-made parts (wood, metal, paint, and rubber) and designed to look sleek and modern at the expense of human comfort. Collection of Christina and Howard Risatti. 3. Bean-bag chair, 2004, (3' x 3' x 3'), no provenance; designed and machine sewn to provide bodily comfort without support or the appearance of “social” constraints. Collection of Joy and Steven Glass. 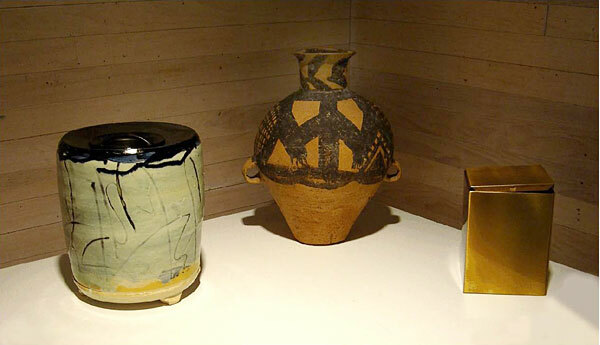 Does the nature and the shape of the container tell us about its contents? And, have production and shipping concerns overridden functional qualities? 1. Anonymous, Milk Basket with lid, late 19th/early 20th century, Somalia? (16.5" x 8.25" dia); hand-woven of natural fiber with leather straps to secure the lid; inside is sealed with a lining of clay. Collection of Christina & Howard Risatti. 2. Anonymous, Apache water bottle, probably late 19th/early 20th century (approx 13" x 5.5"); hand-woven and sealed with pine resin. Collection of Randall and Carol Edmonson. 3. Homestead Creamery gallon milk bottle, 2009 (9" x 3" x 3"), Burnt Chimney, Virginia; machine-formed glass with paper stopper. 4. 1/2 Gallon “Rock ‘N Pour”© milk pitcher (12" x 6" x 6"); High Density Polyethylene (HDPE) plastic; original three-liter version designed in 1998 by Superior Dairy and sister company Creative Edge; 1/2 gallon version designed in 2000. Despite customer complaints about its awkwardness and tendency to spill, this container has been adopted by chain stores. What is time and how do we comprehend and experience its passing? Is stopping time part of the art experience? 1. Bouquet of flowers, 2009. As the beauty of real flowers fade, they become reminders of the temporal dimension of human life and, thus natural order of things. 2. Crystal Cut Vase and artificial flowers, 2009 (15" x 12" dia); manufactured in China of plastic, paper, and metal; distributed as Floral Garden products by Greenbrier International, Inc., Chesapeake, Virginia. Artificial flowers have a way of denying the natural order of things by suspending time, by subtly denying its passage. In death’s wake, how are memories of the deceased kept alive? 1. Burial Urn, Machang phase, Majiayao Culture, China, c.2300-2000 BC (15" x 13" dia); hand-formed ceramic with designs painted in black slip applied before firing; this urn was part of an ancient burial practice honoring the dead. Private collection. 2. Steven Glass (b.1952), Return to Zero (Sanctuary Urn), 2007 (11" high x 18" x 9"); wheel thrown of white stoneware with slip-painted sgraffito markings incised into the surface before firing at cone7 (2,264° Fahrenheit); intended as a reliquary for the cremated ashes of a loved one. Lent courtesy of the artist. 3. Brass Funerary urn, c.2007 (7.5" x 5.5" x5.5"); manufactured by the Triple H Company, Glendale, California; hand assembled of machine-made and lacquered brass components; it is intended as an inexpensive container for cremated ashes. Private collection. Are all tables a blank slate, as it were, or do they reflect the values of the cultural milieu in which they are made? 1. Kate Hudnall (b.1982? ), Chess Table for One, 2005 (36" high x 24" wide x 24" deep); handmade of found and recycled wood with hardware and applied paint. Lent courtesy of the artist. 2. R.T., Table with drawer, 20th century (22.5 wide x 14.25" deep x 26.5" high); handmade of plywood and solid wood that has been bent; finish is varnish. Collection of Christina and Howard Risatti. 3. TV tray table, 2000 (29" x 19" x 14"); wood; made in Indonesia. What is the cost of convenience and how does it affect our attitude toward the world and toward things around us? 1. William Hammersley (b. c.1952), Bench, (2003-2009); made of bent and laminated wood and slate; a complex ensemble with references to rolling landscapes and the passage of time in the cross-like legs. Lent courtesy of the artist. 2. Douglas Finkel (b.1963) in collaboration with Jack Slentz (b.1963), Source Bench, 1997 (16" x 22" x 12"); handmade of poplar and cherry; the base was textured and scorched while the cherrywood seat, shaped with a router, was blackened with a torch. Lent courtesy of Douglas Finkel. 3. Bench/Stool, 2009, plastic (approx 14" x 16"). Does the past survive into the present in meaningful, profound ways? Or has it been reduced to nothing more than a series of decorative logos? 1. Apulian Hydria, Magna Greca (Southern Italy), 4th century BC (7" x 5" dia); small water pitcher; wheel-thrown ceramic with images painted in black slip applied before firing. Collection of Fredrika and Paul Jacobs. 2a. 8 oz. Paper Hot Cups with Ancient Greek motifs and wood swizzle sticks, 2009 (3.5" x 3" dia), R. D. Enterprises, College Point, New York; machine manufactured of paper with ink and plastic coating. This version is a “knock-off” of the original Anthora cup designed in 1963 by Leslie Buck of the Sherri Cup Co., Kensington, Connecticut. Wood swizzle sticks, no provenance (approx 1" x 6"). 2b. 10 oz. 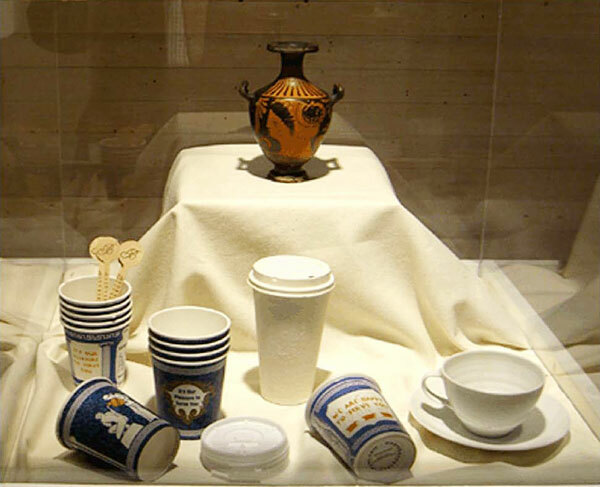 Hot Drink Cups with Ancient Greek Motifs and lids, 2009 (8" x 3.25" dia), Dopaco Company, Inc.; machine manufactured of paper and ink with plastic coating and plastic lids. This version is another “knock-off” of the original Anthora cup designed in 1963 by Leslie Buck of the Sherri Cup Co., Kensington, Connecticut. 3. James Kearns (b.1982? ), Slip-cast cup, 2007 (6.5" x 3" dia); slip-cast ceramic version of the generic paper hot drink cup intended to highlight consumption. Lent courtesy of the Beverly Reynolds Gallery, Richmond, Virginia. 4. Anthora Cup, c.2008 (4" x 3.75" dia); 10 oz. 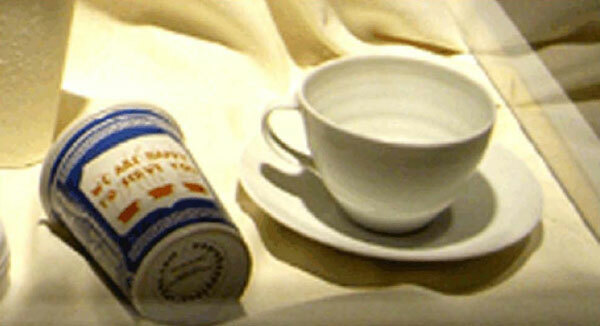 ceramic version of the original paper cup designed by Leslie Buck of the Sherri Cup Co. The ceramic version is licensed from Sweetheart Cup Company, Inc. by Solo Cup Operating Corporation and is made in Thailand. The name, anthora, is from a misprint in a newspaper article about the discovery of a sunken ancient ship; it is a corruption of “amphora,” the Greek word for a two-handled container. Collection of Christina and Howard Risatti. 5. Joanna Constantinidis (1927-2000), British, Cup and Saucer, late 20th century (4" x 6.5"); wheel-thrown porcelain. Collection of Rob Barnard. Do material and process still convey something meaningful about use or have they become subservient to contemporary desires for convenience? 1. 32 Pack Party Doilies, 2009 (7.5" dia); distributed by Greenbrier International, Inc., Chesapeake, Virginia; embossed paper made in China. Private collection. 2. 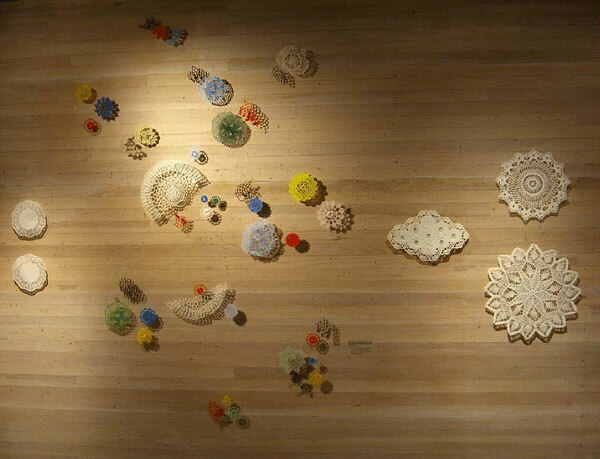 Elizabeth Perkins (b.1974), Lace Mural, 2009 (6' 1" x 5' x 2"); cast glass using the pâte de verre process in which a mold, made from an original, is filled with powdered glass and then fired; temperature varies. Lent courtesy of the artist. 3. Adelina Simeone (1898–1986), Lozenge Doily, c.1975 (9" x 13.75"); hand crocheted of cotton thread with plastic rings. Collection of Christina Risatti. Circular Doily, c.1985 (11.25" dia); hand crocheted of cotton thread. Do means affect ends in the sense that the quality of the objects we make play a role in determining the social importance of their use? 1. Emilio Santini (b.1955), Double stemmed goblet, c.2003 (14" x 2.75" dia); dysfunctional goblet of handblown glass with lamp-worked colored glass details. Private collection. 2. Goblet, 2003, American (8.5" x 3" dia); handblown glass with lamp-worked parts in colored glass; stem for holding and keeping liquid chilled. Private collection. 3. Champagne flute, mid 19th century, French or German (6.75" x 1.75" dia); handblown glass with hand-cut detailing; tall shape for keeping liquid chilled and preserving bubbles. Collection of Christina and Howard Risatti. 4. Absinth glass with Sugar Spoon, late 19th/early 20th century, French (5.75" x 3" dia); handblown glass with hand-cut detailing; stem for holding and keeping liquid chilled. by J. & G. Company of machine-stamped, chrome-plated steel. Private collection. 5. Singlz, 2009 (bottle and glass: 6.75" x 2" dia) (glass: 4.5" x 2" dia); 187 ml, all-in-one plastic bottle and glass designed by Graeme Blake and manufactured by LinkPlas, Ltd., New Zealand of Polyethylene Terephthalate (PETE) plastic. Does the hand, in its struggle to create, impart special qualities to the object that the machine cannot? 1. Landscape with Temple, c.1970, Peoples Republic of China (36" x 16.25"); silk woven on a computer-driven, automated loom for the tourist trade as an imitation of traditional Chinese hanging scroll paintings. Collection of Howard Risatti. 2. Anonymous, Jacquard loom tapestry, c.1980, France (12.5" x 12.5"); “industrial” textile with an image of Paris woven for the tourist trade on an automated, Jacquard loom (not illustrated). Collection of Susan Iverson. 3. Susan Iverson (b.1951), Dream Fragments, 2005 (30" x 83"); tapestry of silk, linen, and wool hand woven on a Gilmore loom using hand-dyed and natural yarns. Lent courtesy of the artist. What does the quality and the size of a container reveal about social values, especially as related to consumption? 1. Anonymous, Pulque mug, c.1300, El Tajin, Mexico (7.25" x 4" dia); hand-formed ceramic with painted imagery applied after firing; mug used for religious ceremonial drinking of pulque (also called octli), an alcoholic beverage made from maguey, an agave plant. Private collection. 2. R.R., Tumblers, c.1950 (6.5" x 3.25" dia); handblown glass with lamp-worked detailing in colored glass. Collection of Christina and Howard Risatti. 3. 12 oz. Picardie French Tumbler, 2007 (5" x 3.5"); tempered glass; originally designed in 1939 by the Duralex Company of La Chapelle-Saint-Mesmin, France, where it is still manufactured. 4. 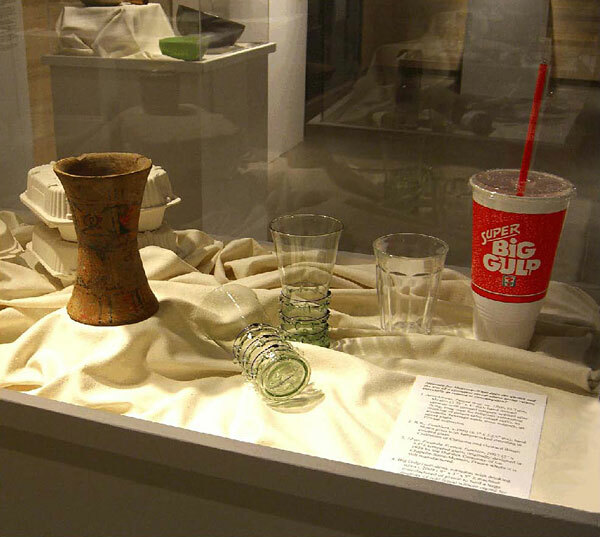 Big Gulp (soft drink container with drinking straw), 2009 (approx 9" x 4.5"dia); machine manufactured of plastic to hold a large quantity of cold liquid without regard for holding or temperature control. 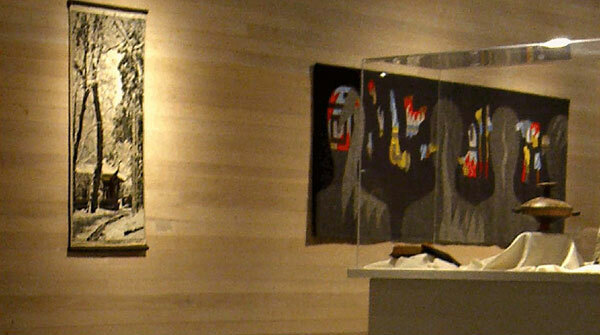 Are there differences in the quality and depth of the sentiments and values that can be invested in objects? In other words, is there a hierarchy of sentiment or are all objects the same in this regard? 1. C. James Meyer (b.1940), A Walk in the Woods, 2007 (2" x 4.5" x 4.5"); hand formed of sterling silver, 18k gold, platinum, and copper with diamonds, wood, paper, and found stone as a reference to natural beauty and as a container for human sentiment. Private collection. 2. Floral Sprig, 2009 (7" x 3.25"); manufactured in China of fabric, plastic, and metal; distributed as Floral Garden products by Greenbrier International, Inc., Chesapeake, Virginia. 3. 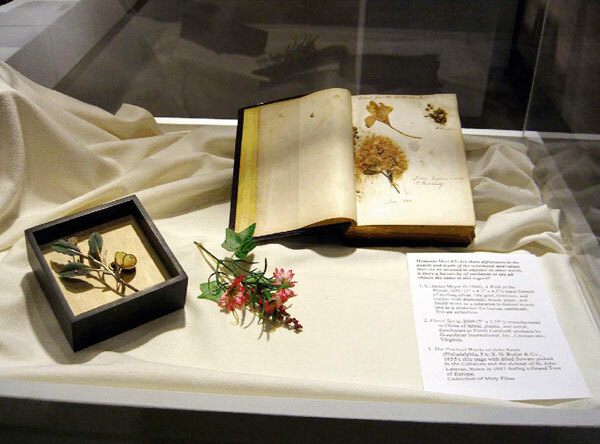 The Poetical Works of John Keats (Philadelphia, Pennsylvania: E. H. Butler & Co., 1855); title page with dried flowers picked in the Coliseum and the cloister of St. John Lateran in Rome in 1883 during a Grand Tour of Europe. Collection of Mary Flinn. Do containers betray something of the value placed on use as a ritual form of personal interaction and social exchange? Have such rituals been sacrificed in the name of convenience? 1. 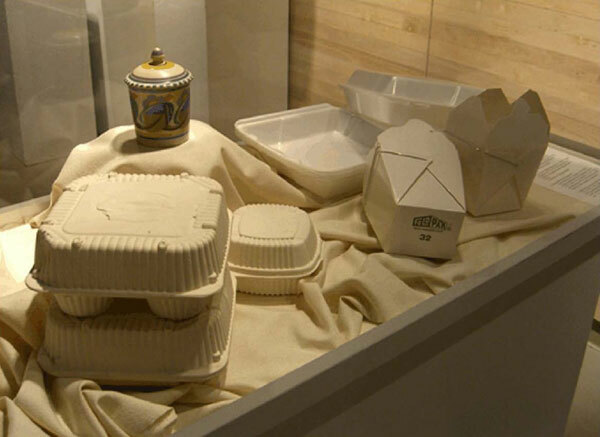 James Kearns (b.1984), Slip-cast fast-food containers, 2007 (6" x 7" x 7"); mold made using ceramic slip. 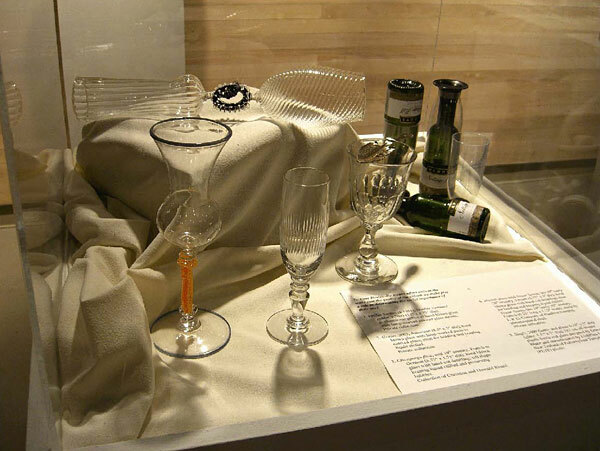 Lent courtesy of the Beverly Reynolds Gallery, Richmond, Virginia. 2. T. J., Art Deco Lidded Mustard Jar, c.1930, Poole, England (4.75" x 3.25" dia); wheel-thrown ceramic with glaze designs painted before firing. Collection of Howard Risatti. Polystyrene (PS) plastic by Dart Container Corporation. Fold-Pak 32, take-out food containers (open: 7.75" x 4.25" x 3.75") (closed: 4.50"
(plastic-coated paper with metal handle). Can functional form exist outside of any historical context or does it unwittingly reveal something about the present and our priorities? 1. Apulian Lekanis, Magna Greca (Southern Italy), 4th century BC (7.5" x 10"); shallow, lidded basin used as a toilet article; wheel-thrown ceramic with imagery painted with black slip before firing. 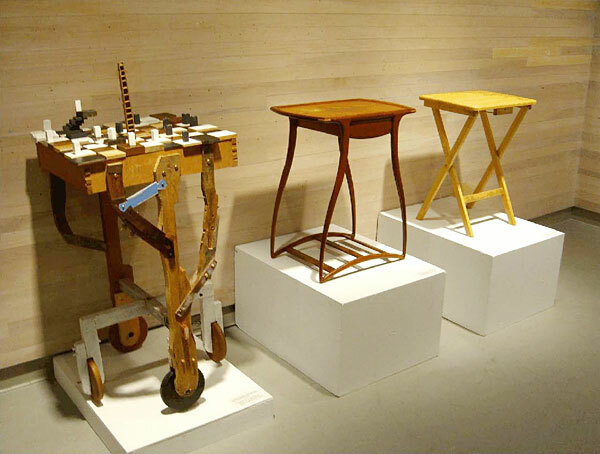 Collection of Fredrika and Paul Jacobs. 2. Steven Glass (b.1952) and Mary Holland (b.1960), No Limit, 1991 (11" x 7.5" x 4"); wheel thrown of porcelain then slip painted with sgraffito drawing before oxidation firing at cone7 (2,264° Fahrenheit). Lent courtesy of the artists. 3. Helen Seton, Lidded Basket, c.1991, Yup’ik Native American, Hooper Bay, Alaska (4" x 3.25" dia); tightly woven by hand of wild beach grass that has been left natural in color as well as dyed pink. Collection of Christina and Howard Risatti. 4. 32 oz. Combo Cylinder (food container), 2009 (5.75" x 3.5" x 4.5"), machine manufactured by W. Y. Industries, Inc. of North Bergen, New Jersey; container made of Polypropylene (PP) plastic; lid made of Low Density Polyethylene (LDPE) plastic. Does the painstakingly handmade still have value and meaning in the face of modern industrial production? Or is it simply a sentimental anachronism in contemporary society? 1. Kiara Pellisier (b.1976), Crumple, 2008 (10" x 10" x 10"); handblown and hand-formed glass. Lent courtesy of the artist. 2. Greg Fidler (b.1970), Vase, 2002 (14" x 5.5" dia); handblown and hand formed of colored glass with applied details. Collection of Christina and Howard Risatti. 3. 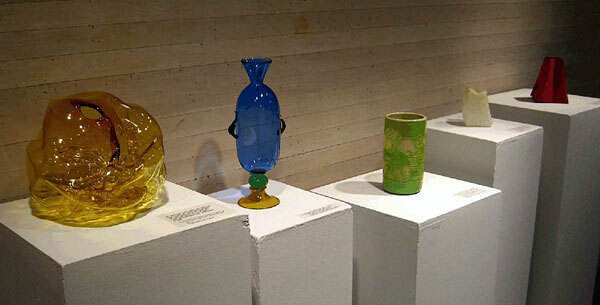 Rick Schneider (b.1970) and Nikki Vahle (b.1972), Vase with figures, 2001 (8.75" x 4.75" dia); husband and wife team; handblown of two layers of different colored glass that has been sandblasted to create imagery in relief. Collection of Christina and Howard Risatti. 4. Elizabeth Perkins (b.1974), Basket, 2008 (6" x 5" x 5"); blown glass using the hot mold process in which hot glass is blown into a mold made from a handmade wax model; when cooled the glass is worked and polished. Lent courtesy of the artist. 5. POPVASE, 2000 (6.5" x 4.5" x 2" x 2.5"); conceived by James and Jo Lott, founders of The Paper Trading Company; handmade of recyclable synthetic paper, folds when not in use. Collection of Christina Risatti. Do the inexpensive objects of convenience that characterize consumer culture undermine the values and sentiments long inherent in social etiquette? The Hunted (20" x 14" x 1"); Trophy (11" 11" x 1"); Dream of the Open Fields (12" x 18" x 1"); The Short Chain (14" x 14"x 1"). Lent courtesy of the artist. Place Mat with Open Checker-board Pattern (11.5" x 15.25"); Place Mat with Serrated Sides (12" x 17"); Place Mat with Oval Sides (10" x 19"). Collection of Christina Risatti. 3. Disney Pirates of the Caribbean Placemat, contemporary (17" x 11.75"); an official Disney product; machine made in China of 100% vinyl for Jay Franco and Sons, Inc. New York, New York. 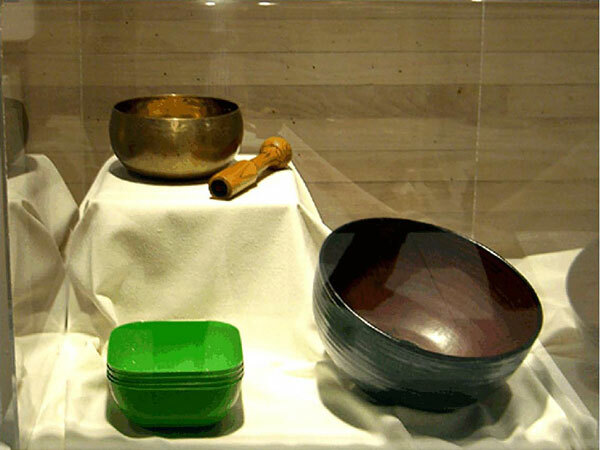 Is the purity of the song the bowl sings still able to enliven the heart and touch the mind? 1. Anonymous, Buddhist “Singing Bowl,” date unknown (3.75" x 6.75" x 7"); made of hand-hammered brass so that, when lightly struck near the rim, it will “sing,” serving as an accompaniment to remembrances of ancestors. Collection of Tim Ford. 2. Kristi Emilsson, Bowl, 2008 (5.25" x 10.5" dia); wheel-thrown ceramic with multiple glazes. Collection of Christina and Howard Risatti. 3. 20 oz. Walmart plastic container, 2009 (3.5" x 4" x 2"); manufactured in China for Walmart Company, Inc. of Polypropylene (PP) plastic and sold in a set of four. 4. Howard Risatti (b.1943) and Derek Bencomo (b.1962), Mallet, 2009 (8" x 1.75" dia); lathe-turned ash with ebony and purplewood inlay. Lent courtesy of the artists. 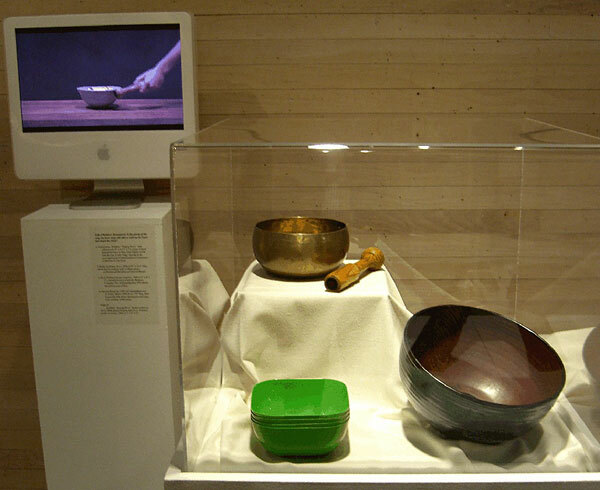 Looped video with audio of ringing of each bowl in succession; the video frame shows a hand gently striking each bowl in succession, allowing time for the ringing to fade away before striking the next bowl. A small wooden mallet is used. Is the line from metaphorical function to practical/personal convenience a raising or lowering of standards of being in the world? 1. 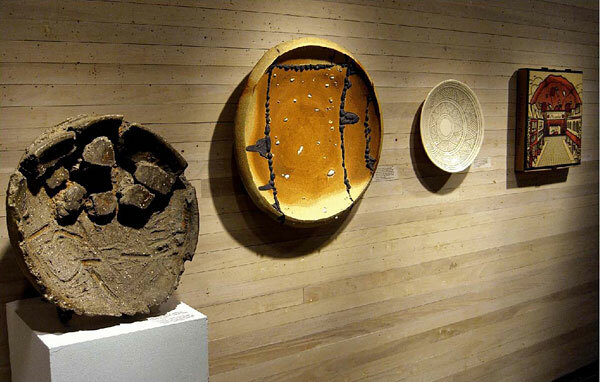 Peter Voulkos (1924-2002), Untitled Platter, 2000 (approx 15" dia); hand thrown and manipulated wood-fired stoneware that implies use while making use impossible. Collection of John Jessiman. 2. Adam Welch (b.1977), Re-constructing Modernism, 2002 (3" high x 25.75" dia); wheel-thrown stoneware, cut and altered then joined together with colored slip and fired to cone10 (2346° Fahrenheit); white chunks are shino glaze. Collection of Christina and Howard Risatti. 3. Wendy Smith (b.1965? ), Inlaid Platter, 1997 (2.25" high x 14.75" dia); wheel-thrown ceramic with inlaid design that has been filed with a different color clay, then the whole has been glazed and fired. Private Collection. 4. Pizza tray/box, contemporary (2" x 18" x 18"); no provenance; machine made of cardboard. Should the look of things take precedence over their functional usefulness? 1. La Conica coffee maker, 1984 (11.25" high x 3.5" dia); designed by Aldo Rossi for Alessi Company, Italy and machine manufactured of stainless steel and copper to look modern/postmodern; note the rather ungainly metal “strap” handle. Private collection. 2. Rob Barnard (b.1949), Teapot, 2009 (6" x 7" x 5"); wheel-thrown and hand-formed ceramic that has been fired in a wood burning kiln to achieve a natural ash glaze; such kilns must be stoked by hand around the clock for several days. Lent courtesy of the artist. 3. Moka Express Cafeteria (coffee pot #327, A4 WG), 1983, Italy (8.25" x 4.5" dia); original invented, designed, and handmade by Alfonso Bialetti in Crusinallo, Italy in 1933; current version machine made of aluminum with a rounded, heat-insulating bakelite handle. Collection of Christina and Howard Risatti. Does the setting play a role in enhancing the experience of eating as a form of social interaction and discourse or is it simply a socially pretentious conceit? 1. Tom Alward (b. 1987), Plate, 2008 (1" x 10.25" dia); wheel-thrown stoneware that has been glazed, then high-fired to 2300° Fahrenheit in a wood-fire kiln; several cords of wood are used to stoke the kiln around the clock for multiple days to achieve specific and varied results. Lent courtesy of the artist. 2. Anonymous, Long-handled Ladle, c.2003, Korea (1.75" x 2" dia; handle 13.25" long); handmade of bamboo and assembled without fasteners or glue. Private collection. 3. Anonymous, Large scoop with handle, c.2003, Korea (handle: 8.5"; scoop: 3" x 1.25" dia); handmade of a single piece of bamboo, the shoots of which are bound with cord to form a natural handle. Private collection. 4. Anonymous, Small scoop with handle, c.2003, Korea (handle: 8"; scoop: 1.25" x .75" dia); handmade of a single piece of bamboo, the shoot of which forms a natural handle (not illustrated). Private collection. 5. Spoon, early 20th century, Korea (about 5"); hand hammered brass (not illustrated). Collection of Rob Barnard. 6. 30 Guestware dinner plates, 2009 (8.125" dia); manufactured of Polystyrene (PS) plastic by Pactiv Corp., Lake Forest, Illinois. 7. 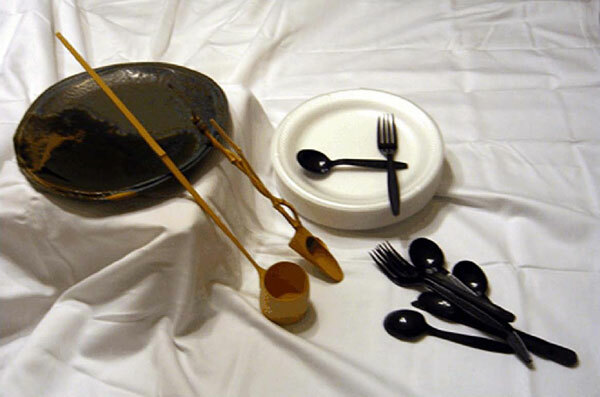 Disposable dinner service (1.25" x 8.75"); no provenance; clear plastic envelopes containing matched sets of various knives, forks, and spoons with paper napkin and salt and pepper packets (not illustrated). Is there a hidden cost to be paid for convenience and economy or price, especially in terms of social values? 1. 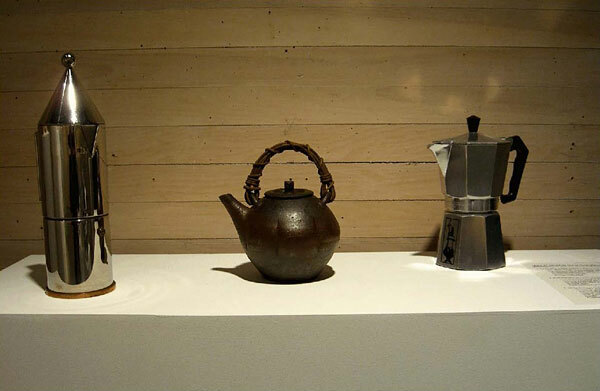 Steven Glass (b.1952), Espresso for 100 (coffee server), 1991 (17" x 11" x 7.5"); reusable; wheel-thrown porcelain with slip-painted designs; oxidation fired to cone7 (2,264° Fahrenheit). Lent courtesy of the artist. 2. Starbucks 96 oz. 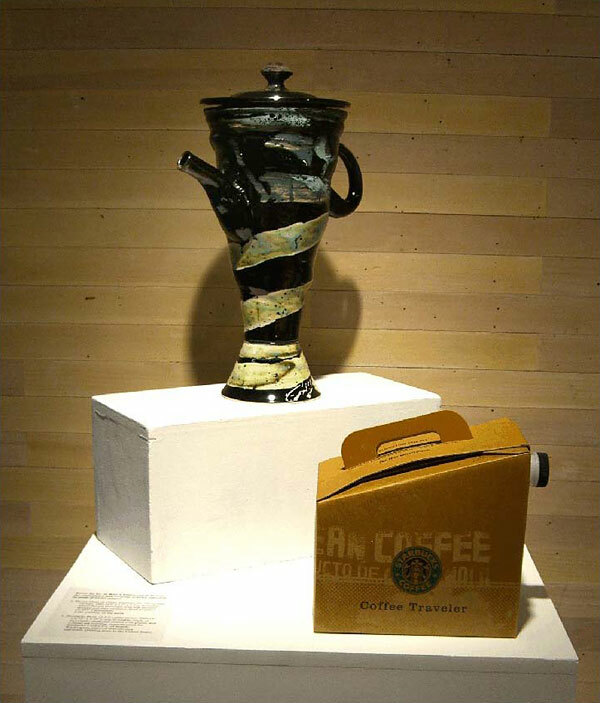 (2.8 L) coffee server, 2009 (9" x 6.75" x 9.25"); nonreusable; made of recyclable cardboard coated with plastic and colored ink printing; manufactured for Starbucks Coffee Co. of Seattle, Washington; place of manufacture unknown; printing done in the United States. If all containers contain, does that mean all containers embody the same cultural values and aesthetic principles? 1. Suk-Jin Choi (b.1975), Onggi Pot, 2009 (12" x 14" x 10"); hand formed on a kick wheel of ceramic using traditional Korean tools such as the dogae and geungae, then glazed and fired. Lent courtesy of the artist. 2. 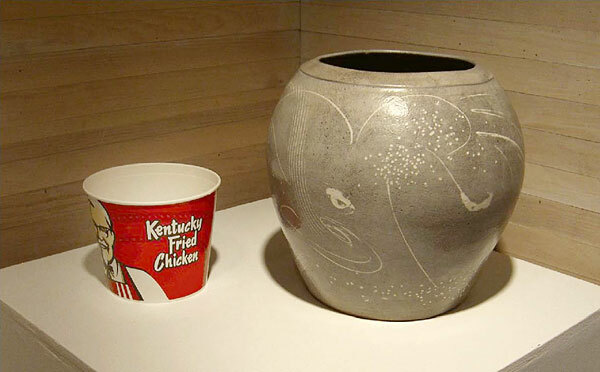 KFC bucket, 2009 (7" x 8" x 6"); no provenance; machine made of paper with plastic coating and ink printing. If all pitchers are capable of pouring, does that mean all pitchers are the same? And, does the look of the thing matter more than its function? 1. Rob Barnard (b. 1949), Pitcher, 2007 (11" x 5" x 4"); wheel-thrown ceramic fired in a wood kiln for several days to achieve a natural ash glaze. Lent courtesy of the artist. 2. 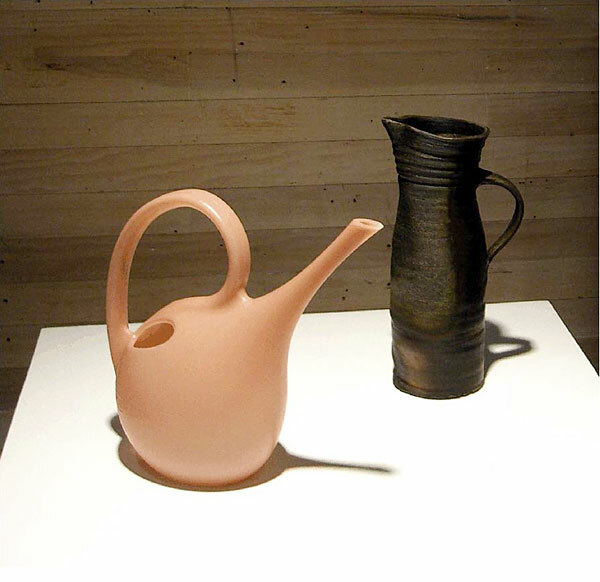 Pink Watering Can, 2008 (10.5" x 11" x 5"); industrially produced in the United States by Plastec Products Company of translucent, High Density Polyethylene (HDPE) plastic. While it looks elegant, because the opening is placed low on the pitcher, it is difficult to fill and readily spills when pouring. 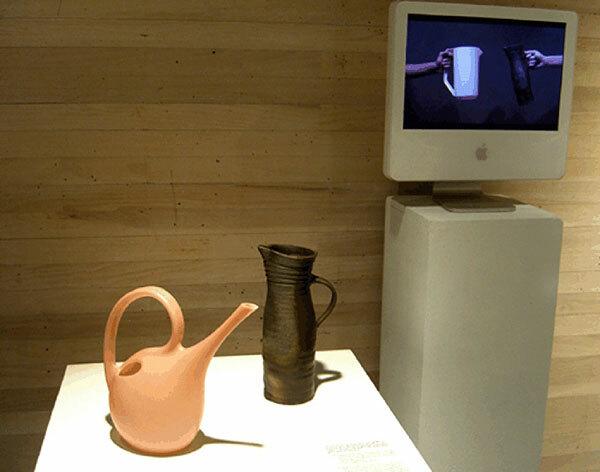 Looped video; video frame, with camera set at level of the pitchers, showing two separate hands pouring water from each of these two pitchers. Audio of water is heard as water is poured from both pitchers simultaneously.